When it comes to the Lunar New Year, Lou Hei is undeniably a huge part of this celebration and it is a traditional practice carried out at every reunion dinner. Consisting approximately a dozen different ingredients from crackers to ginger, carrots, cucumber and plum sauce, there are surely some ingredients each individual would avoid. Good news for picky eaters—there is a D.I.Y Yu Sheng station over at Ginger where you can go ahead and do up your very own plate of yu sheng and customise it to your own liking. Hoping for 2019 to be filled with more luck and prosperity? Help yourself to more servings of carrots and pomelo then! A premium dish that is synonymous to any Chinese celebrations, one wouldn’t expect to find such an exorbitant roast at a buffet spread but here Ginger offers their Roasted Suckling Pig With Kumquat Sauce as the centrepiece at their carving station. Roasted whole for hours over, we were beyond delighted to hear the crackling sound of the crispy skin upon taking a bite and even more so when we sank our teeth to the succulent and incredibly tender meat beneath. Given that a price tag for a whole roasted suckling pig usually runs from S$150 – S$200, we reckon that this is one dish you shouldn’t be shy to head over for more servings to get the ultimate bang for your buck! Lobster enthusiasts would be pleased to hear that Baby Lobster with Abalone Sauce is cooked a la minute at the live station here. Whipped up there and then upon order, fresh baby lobster is then slathered over in a slightly gooey abalone sauce that is intensely rich and luscious. The lobster flesh is easily removed from its shell, assuring nothing except the freshest. Combining its naturally sweet taste with the umami sauce, this duo is a combination that warrants second helpings (or thirds)! Ginger at PARKROYAL on Beach Road prides themselves on serving consistently good quality crabs throughout the year no matter the season, impressing diners old and new and we can confidently say that it is going to be the same this time around. Tossed in a heap of crisp-fried cereal that is fried together with curry leaves and chilli padi to accentuate the savoury-sweet flavours, the crabs hidden beneath leaves little to wonder as to why crabs are easily one of the restaurant’s bestsellers. Do note that Black Pepper Crab and Cereal Crab are available on a rotational basis. Also available at the hot food isle are Steamed Chicken and Baked Salmon topped with deep-fried fish skin, lap cheong and seafood—both of which we expect to be a surefire hit amongst both locals and tourists alike. Crowned as one of Singapore’s iconic dishes, our little red dot has plenty of scrumptious renditions of chicken rice and Ginger’s version is definitely not one to disappoint. Juicy, moist and utterly tender, this may be a simple dish but comforting and hearty all at the same time. Should you be hankering for something more familiar and comforting, other Chinese favourites such as Braised Pig Trotters, Stir-fried Prawns with Greens are also served. What particularly stood out the most for us, however, was the Abalone Fried Rice. Each mouthful brought out an intense ‘wok hei’ aroma, what we deem as an essential attribute a bowl of good fried rice should possess. Yet this divine dish doesn’t stop right there—coupled with the tender and naturally buttery abalone, the Abalone Fried Rice is a showstopper in its own right. Making a debut in Ginger’s stellar Chinese New Year buffet spread and available exclusively during this period of time is their Salad Station, which consists of exquisite yet refreshing delights in the likes of Pineapple Salad with Sliced Bak Kwa and Braised Pig Ear Terrine with Chinese Herbs. Chinese New Year is never complete without buttery treats such as pineapple tarts and kueh bangkit. You’d be delighted to know that besides the luxurious suckling pig, baby lobster with abalone sauce and D.I.Y. 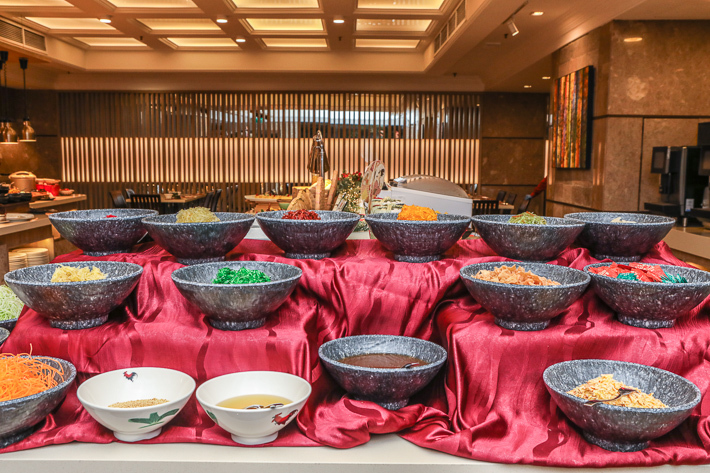 Yu Sheng, Ginger will also be offering a range of Chinese New Year goodies as part of their Chinese New Year buffet spread to usher in Lunar New Year on the right note. Baked in-house, stuff yourself silly with these decadent treats and worry about calorie count only after your meal! Here’s a gentle reminder to quote ‘LICCNY’ upon making reservations at Ginger at PARKROYAL on Beach Road to enjoy 25% off from 21 Jan to 3 Feb and 7 to 19 Feb; as well as 15% off from 4 to 6 Feb. This post was brought to you by PARKROYAL on Beach Road. Hi, just to check, will all the items in the write-up above be offered during the festive lunch hours as well? Only selective dishes available…. disappointed. I thought all dishes mentioned above will b at buffet table….